General relativistic ray tracing simulations of the shadow of the event horizon of a black hole. A team of European astrophysicists plans to capture the world's first image of a black hole, and a newly awarded grant may help that dream come true. The European Research Council has given 14 million euros (about $19.3 million at current exchange rates) to the team behind BlackHoleCam. This project aims to peer at the supermassive black hole at the core of our Milky Way galaxy and image its event horizon — the theorized boundary beyond which nothing, not even light, can escape. 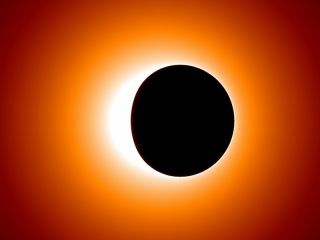 "The technology is now advanced enough that we can actually image black holes and check if they truly exist as predicted: If there is no event horizon, there are no black holes," Falcke added. "Einstein’s theory of general relativity is the best theory of gravity we know, but it is not the only one. We will use these observations to find out if black holes, one of the most cherished astrophysical objects, exist or not," Luciano Rezzolla of Goethe University in Frankfurt, Germany, another of the project's principal investigators, said in a statement. "Finally, we have the opportunity to test gravity in a regime that until recently belonged to the realm of science fiction; it will be a turning point in modern science," he added. The BlackHoleCam team plans to use the huge new ALMA (Atacama Large Millimeter/submillimeter Array) observatory in Chile, among other radio instruments, researchers said. The project will also collaborate closely with the Event Horizon Telescope, an American-led VLBI effort with similar goals.